Nugent Castle, Delvin, County Westmeath, said to have been built by Hugh de Lacy in the 12th century for his brother-in-law, Sir Gilbert de Nugent. 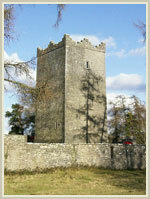 Gilbert later built his own castle nearby at Clonyn, which was burnt down during Cromwell's wars. At the time of Henry II there were in England five male Nugents. Four were brothers, (I) Gilbert, (II) Richard, (III) Christopher, (IV) John, sons of Gilbert de Nugent and Maud de Lacy, through whom they were related to Hugh de Lacy, first earl of Meath. The fifth was a cousin, Hugh. All five presumably accompanied Henry II to Ireland. 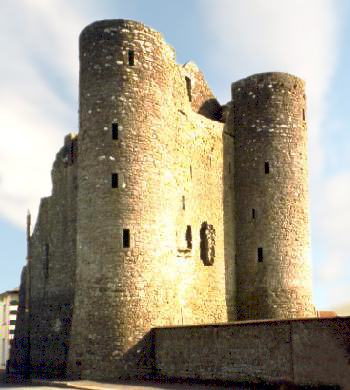 Gilbert married de Lacy’s sister, Rheza (or Rosa), and were granted lands in Co. Meath and, according to some sources, the barony of Delvin. Gilbert in turn made grants of lands in the barony to his brothers and cousin. Hugh received Bracklyn, but I have no particulars of grants to the brothers; in fact there is no other reference to Christopher or John except that it is sometimes stated that Nugents of Bracklyn are descended from Christopher (not Hugh). Gilbert died in 1202 and was succeeded by Richard, known as Di Capella, meaning “of the horses”. It is almost certain that he was ‘Ricardus filius Gilberti’, one of the signatories to the granting of the lands of Meath. His heiress was his daughter Alice (or Maud) who married Richard de Tuit, who became 3rd baron jure uxoris, and the barony descended in that family. For some reason the surname deTuit was dropped, and the eventual heiress Catherine Fitzjohn married Sir William Fitznicholas Nugent, a younger son of the Bracklyn branch. Bracklyn descended directly from Hugh for eighteen generations and then passed by marriage to the Fetherston family (c. 1740). Sir William Fitznicholas, 6th generation after Hugh, acquired Balrath, and by his marriage to his kinswoman Catherine Fitzjohn became 1st or possibly 9th baron of Delvin, which was probably created around 1386 rather then in the 12th Century. In subsequent generations both numberings can be found, until in 1621 the 7th (or 15th) baron became Earl of Westmeath, a title still held by his descendants. All the principal branches of the family are descended from the marriage of Sir William and Catherine Fitzjohn, recorded variously as being in 1385 or 1407. Each main branch will be dealt with in turn. 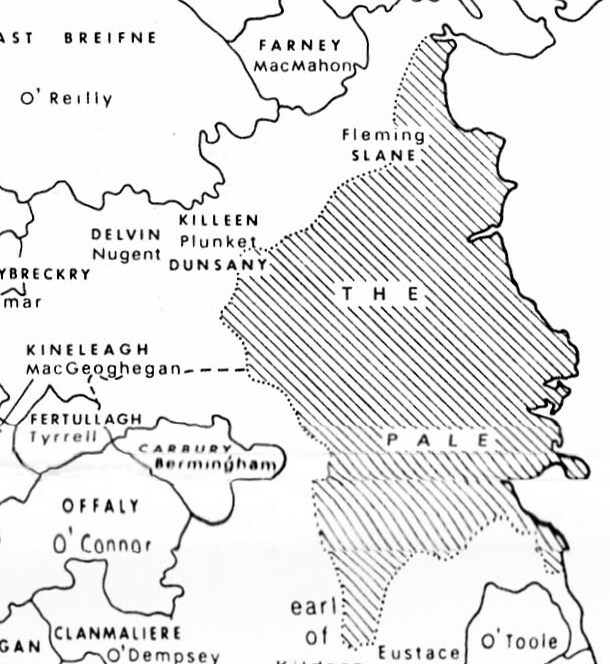 Irish lordships in the early 16th Century showing (close-up below) the Nugent family's possession of the lordship of Devlin close to 'the Pale' of Dublin. Click on image to enlarge. Moyrath: founded by Sir William Oge Nugent, younger son of William Fitznicholas. (living 1432). In this line are descended Nugents of Grenanstown (16th cent.) and Dardistown (17th). The Moyrath branch suffered a number of casualties at the Boyne (1690), and the survivors, apparently without exception, emigrated to the continent with the Wild Geese. The most notable of these was Christopher of Dardistown, one of three Nugents who became major generals in the French army. Grandsons of Sir William Fitznicholas Nugent were (I)James, and (II) Edward, both of whom married heiresses. 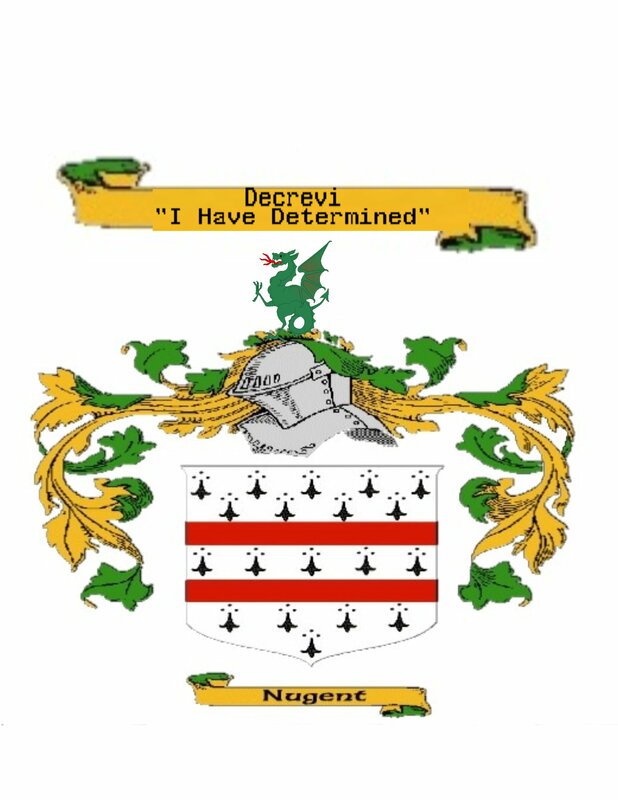 James, heir to Delvin, acquired from his wife Elizabeth Hollywood, Drumcree, Dysert and Donore, and very conveniently there were four sons who inherited, (i) Christopher (Delvin), (ii) Robert (Drumcree), (iii) Lavallin (Dysert) and (iv) Andrew (Donore). Edward, the younger grandson, acquired Clonkoskeran and nether Butlerstown (both Co Waterford). Drumcree: inherited by Robert, the second son, was held for seven generations until forfeited in 1690. The last Nugent of Dru mcree was Oliver, Colonel in King james’s army, and Major-General in the French army, who married Jane, daughter (or sister) of Christopher Nugent of Dardistown (see above). It is recorded that he had a son and a grandson, each named Walter, but it seems more likely that there was only one Walter, who emigrated to the island of Antigua in the West Indies, where in 1721 he married Antoinetta Leroux, the 12 year old daughter of a French merchant. From this marriage the Nugents of Antigua are descended. 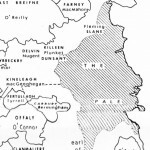 Sub-branches of this branch are Nugents of Newcastle (Co. Westmeath) and of Newhaggard (Co. Meath). 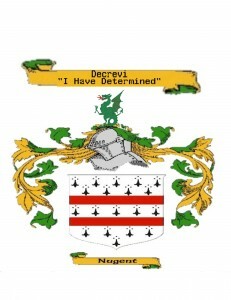 Dysert: inherited by Lavallin (see above) who died 1517. Remained in the family until the early 19th century when there was a failure of male heirs the heiresses (i) Margaret, who married Andrew Savage of Portaferry, Co. Down, and (ii) Barbara, who married James O’Reilly of Ballinclough, and both these families took the name of Nugent. Sub-branches of the Dysert branch are Catleward (Co. Down), Coyne, and Ballinacorr. Donore: inherited by Andrew (4th son of James Nugent and Elizabeth Hollywood), died out with the death (c.1956) of Sir Walter Nugent, 5th Bart, who was only a Nugent in the female line. Sub-branches are Nugents of Clonlost, Kilwater, Carpenterstown, Castlerickard, Warrenstown and Correllstown, whilst several families moved to Dublin. Clonkoskeran: These Nugents in Munster were originally named de Winchendon and are not thought to be related to the Nugents proper. Nine generations are recorded, after which the property passed by marriage to the family of Humble, who later restored the name of Nugents, though there are not thoughts to be any Nugents remaining in Clonkoskeran. The linked property of Butlerstown passed to a cousin, while another sub-branch settled at Diles (Co. Waterford). Carlanstown: Sir Thomas Nugent of Carlanstown was the younger son of the 4th (or 12th) Baron Delvin, who died in 1537-8. From this branch came Robert (1702-88),a prominent politician of the English parliament, created successively Viscount Clare, and Earl Nugent, and equally notable are his grandsons, Field Marshall Sir George Nugent Bart. (now represented by Nugents of Waddesdon), and Admiral of the Fleet Sir Charles Edmund Nugent, whose parents Lt Col Edmund Nugent and Elizabeth Vernon were not considered to have been legally married, which may be the reason there was no legitimate male heir. 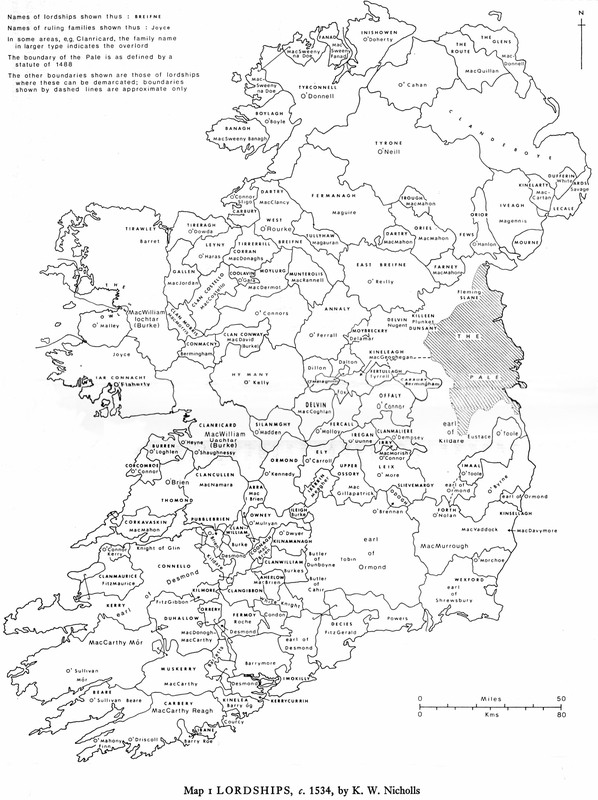 Sub-branches are Nugents of Clontiduffy, Portlomon and Kilvalley. Riverston: Thomas Nugent of Pallas (Co. Galway), second son of Richard, 2nd Earl of Westmeath,Chief Justice of the King’s Bench in Ireland (1687), was created Baron Riverston by King James II in 1689. 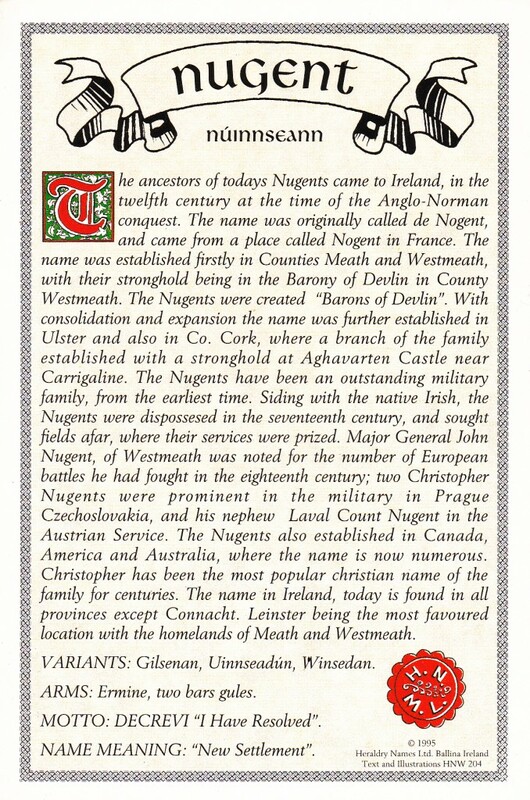 The validity of this creation was often challenged, on the ground that James was not then properly King of Ireland, but subsequent generations continued to use the title until 1871 when the holder of the title, Anthony Francis Nugent, succeeded to the Earldom of Westmeath. The present Earl is a direct descendant. 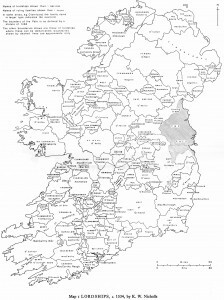 Sub-branches of this family are Nugents of Ballinagar and Cranna, (both Co. Galway) and of Finglas (Co. Dublin). Delvin/Westmeath: The descent of the Barony of Delvin can be traced from Gilbert de Nugent (in the time of Henry II), and has remained continuously in the Nugent family since about 1400. In 1621 the 7th (or 15th) baron was created Earl of Westmeath, and in 1822 George Thomas John, the 8th earl, was raised to Marquess. This title however died with him in 1871, and only the earldom passes to the Riverston branch. There are a number of branches descended from this branch: Coolamber and Clonmore, Ballina, Clonigerah, Enagh, Farrenconnell, Kilmore (later Robinstown), Lissanegan and Killasonna (Co. Longford), Dromin (Co. Longford) and Tubber (Co. Galway). Besides the various branches and sub-branches set out above, there are a number of references to other branches of which at present I have little information. There are, for instance, several conflicting references to Streamstown, and others to Karro Langston (or Carrobonny, Ballincarrow may be the same), Dromeng, Faragh, Dungomin (Co. Cavan), Morton, Aghnagararan (or Armagoran), Co. Langford), and Castle Nugent. Ross Castle near Mount Nugent. Another castle built by a Nugent, now offering rooms to rent. 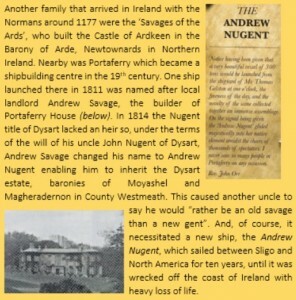 For more about the Nugents in Ireland go to Nugent Genealogical Sources and download Oliver Nugent’s History of the Drumcree Nugents.